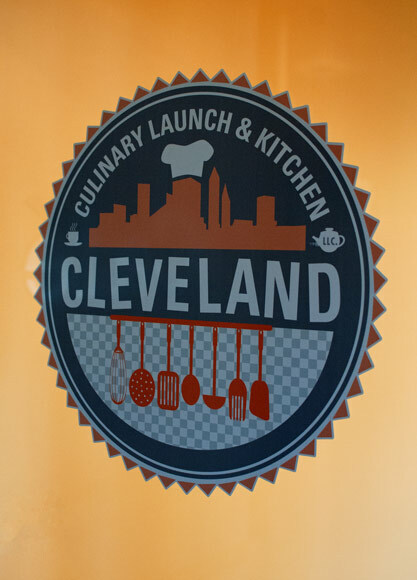 When the Cleveland Culinary Launch and Kitchen (CCLK) opened three years ago, its mission was to increase the success rate of local food business in the region by serving as an incubator for entrepreneurs looking to bring their culinary products to market. Partnered with the Cleveland offices of the nonprofit Economic and Community Development Institute ECDI, the CCLK opened at 2800 Euclid Ave. in June 2013 with just one company. It offered fully equipped commercial kitchens, business support and networking opportunities to its tenants. The launch quickly grew to host five food entrepreneurs within its first three months. Today, the CCLK is home to 52 food businesses with a waiting list for those queuing up for a spot in the successful venue. In the past three years, more than a dozen incubated companies have grown so much so that they've moved into their own spaces to accommodate larger orders, a broader customer base and a loyal following. “With the kitchen being a launch kitchen it is our goal that our members use our space for a short while to launch and grow their business, then grow into or build their own facility,” explains Melanie Robbins, CCLK marketing and media manager. “We are pleased with the overwhelming acceptance from the community that we have received in the last three years. CCLK is excited to continue to be a part of the food scene for small businesses here in Cleveland." This week, Fresh Water offers up a taste of three successful CCLK graduates that have either already left that cozy nest or are in the process of settling into a place of their own. Brothers-in-law Drew Anderson and Luke Visnic discovered they had a unique affinity in common: they both liked fermented foods. Visnic’s love stemmed from his Slavic and German background and the way his grandmother made sauerkraut, while Anderson started making sausage, pierogis and sauerkraut while living in Virginia to sate cravings for hometown Cleveland foods. So the two got together and started making sauerkraut for fun. Cleveland Kraut began with four sauerkraut varieties, selling them on Saturday mornings at the North Union Farmers Markets in Shaker Square and at Crocker Park. Anderson and Visnic made their first sale in January 2014. Today the duo has six flavors, from classic caraway to Gnar Gnar, which is "chock full of gnarly ingredients that give this sauerkraut a slow heat." Anderson and Visnic still sell Cleveland Kraut at the farmers markets, but they’ve also expanded to eight states, from Chicago to New York and into local grocery stores such as Heinen’s stores, Zagara’s, Dave’s Markets, Giant Eagle Market Districts; and smaller groceries like Tremont General Store and Ohio City Grocery. Top all that off with this sweet bit of cabbage: Chef Michael Symon chose Cleveland Kraut to serve alongside his brisket, pork belly and ribs at the new Mabel’s BBQ on E. 4th Street. For obvious reasons, the company outgrew the CCLK last year. In July 2015 the fermenters moved into the old Cleveland Twist and Drill factory at E. 49th Street and Lakeside Avenue. While Cleveland Kraut was fermenting in 22 gallon barrels at CCLK, they are able to ferment in 55 gallon barrels in their new 3,000 square-foot space, producing about 6,000 jars per month. Anderson and Visnic have added seasonal krauts to their regular lineup. “We’ve made spicy ramp pesto kraut," says Anderson, adding that the heirloom carrot and thyme flavor changed the sauerkraut to a purple-pink. “It’s been very popular. We’re excited to try something with fennel heads.” To find out which of the new creations have staying power, Jukebox tavern in Hingetown acts as a test market place. They put a new flavor on the menu for a couple of weeks so Anderson and Visnic can get customer feedback. Anderson credits both CCLK and ECDI, which helped secure a line of credit for the company's expansion, for the success of Cleveland Kraut. In 2010, Aaron Powell was working as a communications coordinator and freelance graphics and web designer when he started running to get in shape. On one run, he stopped in a health food store and discovered kombucha. The discovery changed Powell’s career path. He fell in love with kombucha – a fermented, slightly sweet green tea drink – and he his wife, Danielle, began brewing it at home. By 2014, Powell had bottles of different kombucha, marked “batch 1” or “batch 4.” As he made sample bottles to give out, friend and fellow entrepreneur Trevor Clatterbuck, founder of Fresh Fork Market urged Powell to stop producing his drink at home and call CCLK. 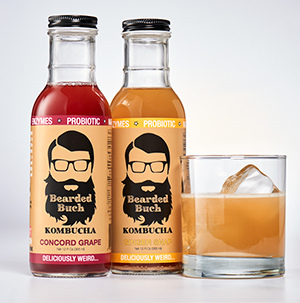 A few short months later, Bearded Buch was an official business in CCLK and Powell’s first commercial batch of kombucha was brewed by June of that year. Bearded Buch began by selling at farmers markets. Today, the sassy beverage comes in four flavors and can be found in grocery stores, health food stores, cafes and restaurants all over Northeast Ohio. Powell’s face is depicted on the bottle, illustrating the reason behind the company’s name. Earlier this month and with the help of an ECDI loan, the company moved to a 5,000 square-foot facility in an former bakery at 4464 Broadview Road in Old Brooklyn. Powell estimates his first batch of kombucha brewed in the new home will be ready in two weeks. He also figures that after two years in the new space Bearded Buch will be ready to move to an even larger space. Bearded Buch currently has four employees and hosts kombucha brewing classes once a month. As for his customers, they love Bearded Buch for its flavor, which Powell describes as “deliciously weird,” but also for the health benefits. “It keeps the gut healthy, and that helps everything else,” Powell says. “The yeast and bacteria are probiotics with digestive enzymes. It’s doesn’t heal or cure anything, it just helps put your gut in alignment. 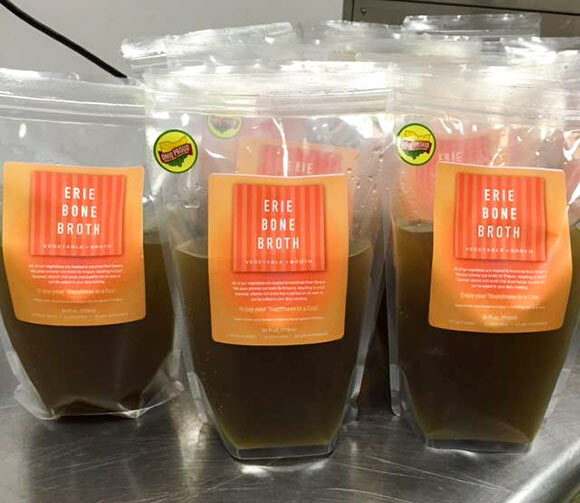 Last January, Kelly Dimacchia began making bone broth as a way to alleviate her arthritis pain. Bone broth, made from chicken or beef bones, is rich in nutrients like collagen and gelatin and has been a prized elixir for centuries for its healing qualities. After Dimacchia told friends how impressed she was with the effects, they started buying her bone broth. By May 2015, she had officially started Erie Bone Broth and was working out of the CCLK producing 400 bags of frozen broth a week with one 25 gallon kettle. Dimacchia makes both beef and chicken Erie Bone Broth using 20 different organic vegetables and herbs. “Each vegetable serves a purpose,” she explains. The beef broth is made using only grass-fed beef bone and marrow, while the chicken broth is made with pasture-raised chicken bones and feet. The functional medicine department at the Cleveland Clinic was so impressed with Erie Bone Broth that the staff asked her if they could carry the 24-ounce pouches at the Healthy Living Shop. Dimacchia’s broth is also available at area farmers markets and in the frozen food sections at 21 grocery stores, including all Heinen’s stores, the Shaker Square North Union Farmers Market, Mustard Seed stores and Miles Farmers Market, to name a few. Business has been good, but earlier this year, Dimacchia found she was running out of room at CCLK. “My new 60-gallon kettle takes up 90 percent of the freezer.” Additionally, Dimacchia says she is coming out with a turkey bone broth using turkey necks, which “really makes the flavor pop,” and has a bunch of bison bones in her freezer that she’d like to experiment with. Dimacchia started looking for a new kitchen earlier this year. In May, a friend who owns Harper Engineering purchased the former Christ Deaf Lutheran Church building at 2203 Superior Ave. and offered her 10,000 square feet on the first floor. Dimacchia quickly accepted the offer and asked fellow CCLK tenant Randy’s Pickles to come along. The pair are now building two 4,000-square-foot side-by-side kitchens for their thriving businesses. Construction on Erie Bone Broth’s new kitchen is scheduled to be completed by the beginning of September. In addition to launching her turkey broth, and perhaps bison bone broth, Dimacchia says she is planning on making a vegetable broth and a dehydrated bone broth as a replacement for bouillon cubes. She is also working on a private label broth for dogs using bone broth and frozen yogurt. It all adds up to a steaming bowl of opportunity - for broth afficianados, Dimacchia and even a host of future employees. “I will buy three kettles immediately,” says Dimacchia of the forthcoming move and additional space. “I expect this to be my final landing place because there’s so much room to grow.” She plans on buying four to five additional kettles as well.